We might think that a plant with such a special name must have a lot to offer our gardens, and if you think that about the Sacred Bamboo, then you are right. These plants are not only beautiful enough to be considered sacred in some cultures, they are true work-horses in the garden – thriving where other plants struggle to survive, bringing color and interest in every season. They do have a superficial resemblance to bamboo, although they are completely unrelated to the true bamboos, which are a kind of grass. Instead they are actually close to Barberry, which is only visible when you look at the flowers – certainly not when you look at the plant. With their leaves divided into many small segments, they grow as a cloud of foliage that is at the same time light and airy, yet prominent, and those leaves often pass through several color changes as the seasons pass, bringing continuing interest to your garden with no effort from you. 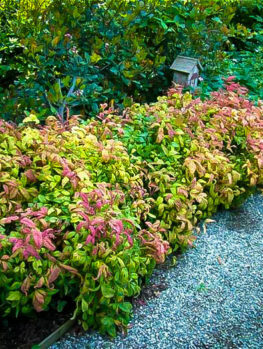 The changing color of the foliage are the main feature of these plants. It is this that makes it so useful, as colored foliage lasts so much longer than flowers do, and brings brightness and interest for months at a time. 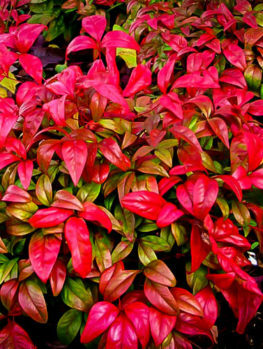 Depending on the variety you grow, this color usually appears in spring, when the new growth is often bright red in color, or alternatively lime-green. In fall, the leaves turn intense shades of red, scarlet and orange. These colors are as powerful as those of typical fall trees like maple or oak, and bring intense color to shady corners of your garden. Most plants have a preference for sun or shade, and only grow well when giving the ‘right’ conditions. 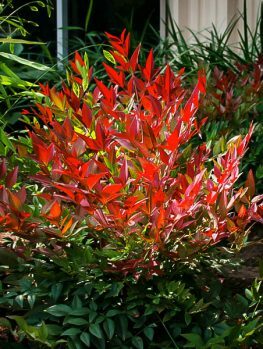 In contrast, Nandina is a very adaptable plant, that grows well in full sun, but also grows well in partial shade and even in full shade. Because it does grow in full shade, it is often seen as only useful for filling those dark corners of the garden where nothing else will grow. 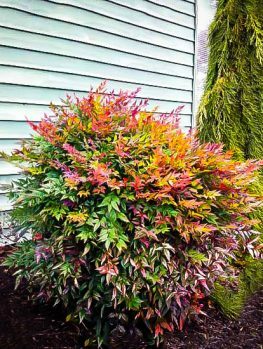 While that certainly is a great use for this plant, it is beautiful and interesting enough to be used in brighter spots, where it will also perform at its best, and show the strongest foliage colors. It is as a foliage plant that Sacred Bamboo stands out. Each leaf is divided into many, many segments, creating a cloud of small leaflets that surrounds the stems. Use it as a specimen among other plants, or in groups to fill areas of your garden. 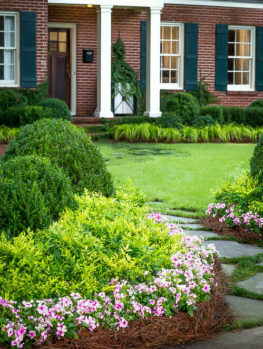 Smaller varieties are great choices for an informal border to a bed of larger plants, or to fill a narrow space between a wall and a path or driveway. This is also a perfect container plant, again especially with the smaller forms, and the upright stems with their glossy leaves work perfectly to give height in larger planters, surrounded by flowering plants, or alone in larger planters. 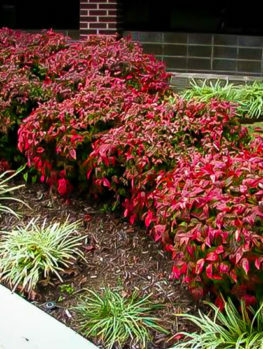 Since they are constantly changing with the seasons, using shrubs like this saves you all the work and expense of regularly re-planting annual flowers and bulbs, and is a great tip for low-maintenance gardening. If you have partially-shaded areas in your garden that you want to fill with plants, then Sacred Bamboo is a great choice. Its greatest virtue is its ability to grow anywhere from full sun to full shade. If you were to think of the ideal location for it, a spot with sun all morning, and shade in the afternoon would indeed be ideal. 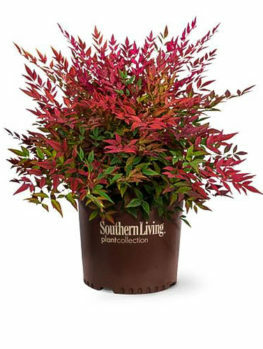 This will give the best foliage color, and the sturdiest growth. In most areas, full sun all day is fine too, but a good supply of water is needed for plants in full sun, and especially in the hottest states, afternoon shade is preferred. However, all types of shade are also suitable for the Sacred Bamboo, from the light shade of a few tall trees to denser permanent shade. Foliage colors will be softer, and more pink or orange than red, but those colors are attractive too, so your plants will still ‘earn their keep’ in your garden. For filling darker corners of any garden, this plant is an ideal choice, and these are the spots where you will often see this plant in other gardens. This plant is also often called Sacred Bamboo or Heavenly Bamboo. Although you might think it is a variety of bamboo, this is only because it has upright stems growing from the ground in a clump, and many small leaves. Once it flowers and produces its berries, it is immediately clear that this is not a bamboo at all, which never have conspicuous flowers or fruits. The leaves are large (up to 3 feet long), but each leave is divided into thin stems carrying small leaflets, and these are only about 2 inches long and 1 inch wide. Although there are only a few stems on a plant, and not so many leaves either, it looks like there are hundreds of leaves, forming a cloud around the plant and reaching from the ground up into the air. 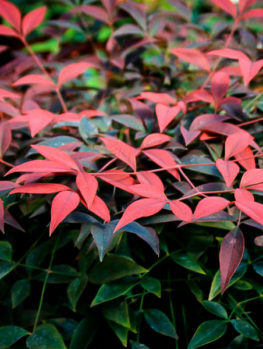 The new leaves are often reddish in spring, and in many garden varieties this has been developed into a brilliant red color that makes a real splash in the garden. In fall the leaves turn beautiful shades of scarlet and orange, making a gorgeous, colorful display. The stems themselves are unbranched, and grow in a clump from the ground. In the wild plant the stems can grow 6 to 8 feet tall, or even more, and the clump can be 5 feet across. However, most of the varieties grown in gardens are a lot smaller, as we shall see. In warm areas the plant is evergreen, and it always has leaves. In colder areas, once the winter temperatures reach minus 10 degrees, some leaves will be lost, and in the coldest areas where it is hardy – zone 6 – it can be completely deciduous. However even if the cold kills the tips of some branches, new shoots quickly develop from the base of your plants, to replace them and keep it looking beautiful. In spring sprays of flowers emerge from the top of the stem. The individual flowers are small, just ¼ to ½ inch across, and white, with a yellow center. There are many flowers in each cluster, called a panicle, and these arch up from the center of the stem in an attractive way. 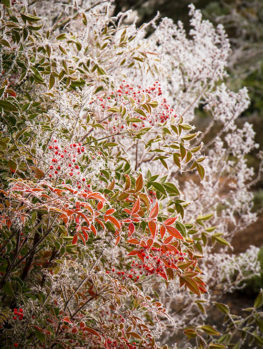 The flowers are replaced in time with bright red berries, so that by fall and early winter these clusters of berries make a beautiful display. 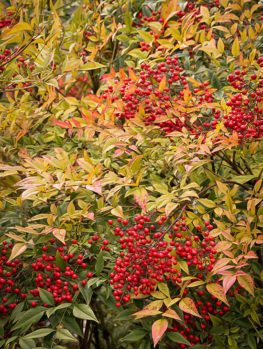 One of the wonderful things about Nandina is the large number of varieties that are available for gardens. These come in different sizes, and have special foliage colors or other features that make them unique. 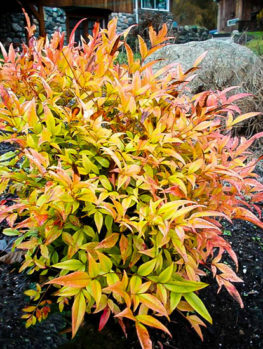 The Firepower Nandina was found in a nursery in New Zealand, and introduced into the USA in 1985. It was an instant hit, not just because of its dwarf size, but because it does not flower. This means it can be grown in areas where there is a potential for it to be invasive and spread by seeds. Since no seeds are produced, this plant cannot spread. Spring growth is a bright lime-green, and spectacular fall colors of red and orange last all winter long. This dwarf plant only grows one or two feet tall, and it makes an ideal edging for beds, or a specimen in smaller spaces. 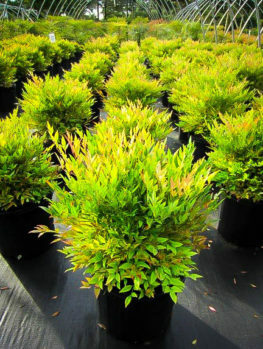 A little smaller than ‘Gulf Stream’, the Moon Bay Nandina unique plant has upright-pointing foliage, giving it a denser look than other forms. 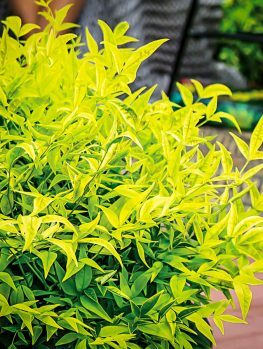 It is also special for the yellow-green to lime-green coloring of the spring growth, brightening a shady area at that special season. This variety comes from a nursery in Houston, Texas and is known for its compact, rounded form. It needs no clipping to keep this form, making it ideal for those who love a neat garden. It also has wonderful fall colors of red and orange. 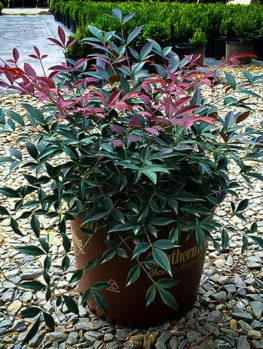 This is a medium-sized variety of Nandina with strong purple tones in the fall and winter colors. It does produce berries, and so is best grown in cooler areas where it will not become invasive. 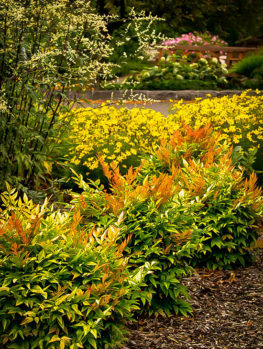 You can brighten any corner of your garden with Lemon Lime Nandina, which is noted for its yellow-green spring growth that turns a bright lime-green for the summer. This variety does not produce berries and can be grown virtually anywhere. Step 1: Dig some organic material into the planting area. Step 2: Dig a hole 1-2 inches deeper than the pot, and twice as wide. Step 3: Remove the pot and place the plant in the hole. Step 4: Put back 2/3 of the soil, and firm it down around the roots. Step 5: Fill the hole with water and after it drains away, put back the rest of the soil. Step 6: Spread mulch over the root zone, clear of the stems. Water the pot thoroughly the night before planting. The organic material you use can be garden compost, rotted animal manure, rotted leaves, or peat moss. Mix this into the soil where you are planting, using a spade or fork to turn over the ground 8 – 12 inches deep. Once you have done this, dig a hole that is the same depth as the pot, and several inches wider. After planting, a mulch of compost or shredded bark can be spread over the soil to conserve moisture. This should be 2-3 inches deep, and keep it away from the stems. During the first growing season, water at least once a week, and more if the weather is very hot and dry. Growth will always be lusher and fuller if your plants receive sufficient water, so using a mulch, and watering during dry weather is worthwhile. Once established, your plants will be resistant to summer drought conditions, and will need no special care. When watering, always water thoroughly, so that the soil is soaked well down. A steady trickle for a couple of hours once a week is much better than a quick spray once a day. A little general fertilizer for evergreen trees, applied in early spring, is a good way to keep your plants healthy and thriving. Using garden compost or manure is an excellent alternative if you prefer a more organic approach, and always gives good results. That, and some watering during extended dry spells, is all the care this low-maintenance plant needs. It has no pests or diseases, and deer as well as rabbits usually leave them alone too, so this truly is a low-care plant. 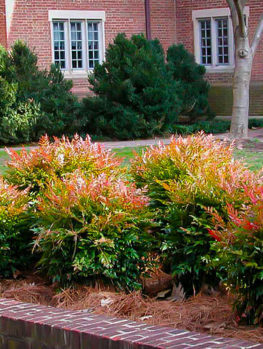 Nandina grows by sending new stems up from the base of the plant. These stems do not branch, but they become a little longer each year. Over time, after several years, the lower leaves on the stems will fall, and the lower part of the plant may become a little bare. To prevent this, and keep your plants full and densely leafy, remove a few of the oldest stems each year, in spring. Simply cut them off at ground level. This will encourage new shoots to develop from the base of your plants, keeping them full and dense right to the ground. This simple care is all the trimming needed. The Sacred Bamboo grows wild in China, Japan, and India. In those countries it is often grown in the grounds of temples. The sprays of red berries are sold at Chinese New Year to celebrate the season and also for temple visitors to use as offerings. It is of course this use that has earned the plant the title of ‘sacred’, or ‘heavenly’. When first seen by western gardeners it was immediately identified as attractive and valuable for gardens. In fact, it was among the very first plants send to Europe from China by the first plant collector to visit that country, a Scotsman, William Kerr. He sent plants to England in 1804 from Canton – today’s Hong Kong. The Japanese call this plant nan-ten, and it was from this name that the botanist Carl Peter Thunberg – an expert on Asian plants – invented the name Nandina. The plant remains hugely popular in Japan even today, where there is a special society for lovers of Sacred Bamboo, and they cultivate many varieties unknown in the West. Nandina is one of a small number of plants that has its own group, or genus. There is just one species, Nandina domestica. This plant is placed by botanists in the Barberry family (Berberidaceae), along with the well-known barberry plants, and other common garden plants like Oregon Grape (Mahonia) and the ground-cover plant called bishop’s-hat (Epimedium). Nandina doesn’t look very much like these plants at all, but the flowers themselves are very similar, and that is what botanists use to place plants in groups. 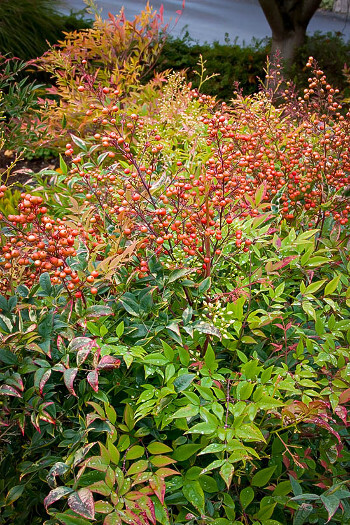 The wild type of Nandina is considered invasive in some states because in warmer areas the seeds are carried by birds and sprout in the forests, competing with native species. Invasive plants like this interfere with the local ecology and can reduce the numbers of natural plants, as well as affecting animals, birds and insects that depend on those natural plants. It is not clear how exactly how much this is actually happening, but some people have expressed concern about this plant escaping from gardens, so it is something to consider. At the Tree Center we take the environment seriously, so we are careful to offer you a choice of plants that produce no seeds, or only a very few. This way your plants cannot spread into the surrounding countryside. The varieties we offer, such as ‘Firepower’ and ‘Gulf Stream’ have all been created by plant breeders conscious of their responsibilities to nature, and keen to give gardeners plants they can grow safely, no matter where they live. If you live in a warmer area, and you do see any red berries developing on your plants, it is just a moment’s work to snip them off – that way you can relax and enjoy your plants and garden. You can be sure you are doing no harm to Mother Nature growing these useful and attractive plants.